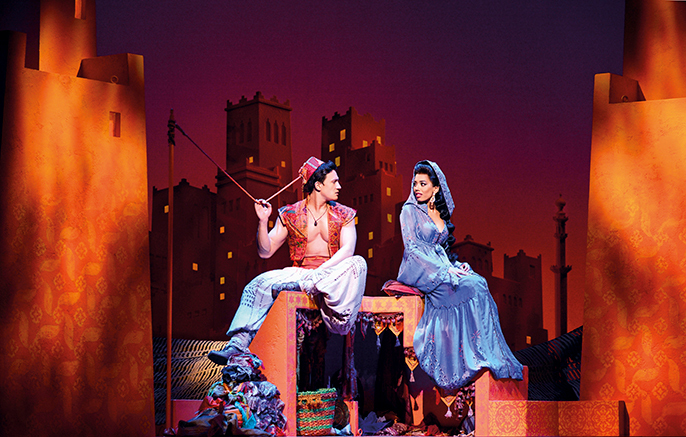 Open auditions will be held at London’s Pineapple Studios for the 2017/18 cast of Disney’s hit new West End musical Aladdin, which opened to critical acclaim at the Prince Edward Theatre in June 2016. Auditions for both male and female singers and dancers to play ensemble and featured roles will be held on Monday 16 January 2017. Disney’s casting team is looking for athletic, technically-trained dancers with very strong technique in all styles, including tap, as well as excellent singing voices. Male dancers with acro, gymnastic and/or tumbling skills is a plus but not essential. Singers should be excellent and be able to dance well in order to make up the ensemble. Attendees must be aged 18 years or older, eligible to work in the UK and have a playing age of 20s-30s. Actors of all ethnicities and cultural backgrounds are strongly encouraged to attend. Open auditions were held in 2015 for the original London company, and seven members of the 38-strong company were cast from those calls in London, Manchester and Birmingham. Contract type is 1 year, fixed term from 5 June 2017, plus 6 weeks rehearsal time prior to this date (with a possible option to extend); SOLT/Equity rates apply to salary; location of Aladdin is the Prince Edward Theatre, 28 Old Compton Street, London, W1D 4HS. Closing date for application is Monday 16 January 2017.